One can look to book profits at 17650-17700 zone if comes.Nifty would be 5300 odd. TCS seems to have started its decline below 775. The stock could even see 745-720 in short term. Avoid longs here. In the last few days had been mentioning about a good built up seen in midcap banking stocks – Dcb, Dena, Vijaya, Uco have been doing well. 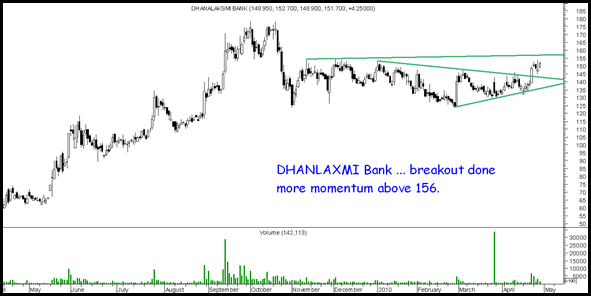 Watchout for Vijaya , Dhanlaxmi Bank and IDBI to give 5-8 %move in near term. Shipping stocks are making interesting long term patterns. Watchout for GE shipping,SCI and Mercator in the next couple of months. 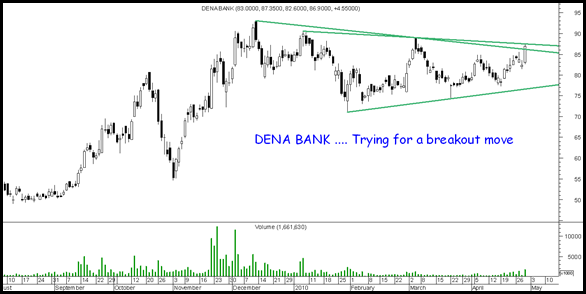 Dena Bank :The stock is closing on a breakout. Buy on dips with 80-81 stop. The stock has given a breakout around 147. Further momentum could come on crossing above 156. 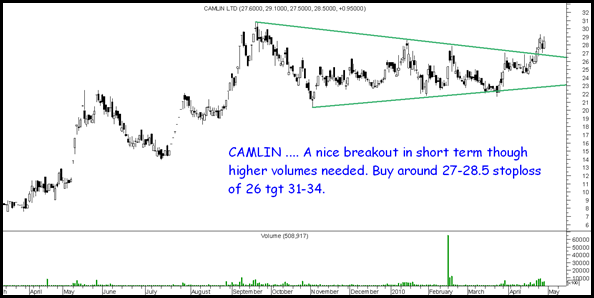 Nice breakout with volumes but is not a highly traded counter so position accordingly.Buy around 27-28.5 stoploss of 26 tgt 31-34 in short term. Whats your view on the market now. I think the market will stay in the current levels of 17540-17640 (Currently @ 17600). There are no more positive or negative cues left for the afternoon. Should we exit now? 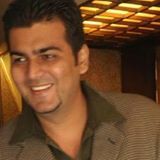 sirji i also look good camlin, and what r u say abt. CANFINHOME? Hold on to the same for short term. SIRJI MLL GOES DOWN FROM WHERE IT PICKUP?